These beetles are fast-moving, relatively large predators that attack a wide range of insect prey; a few species eat seeds and play a role in reducing the weed seed bank in the soil. They are typically black in color, often with a metallic sheen. Since they are nocturnal, they often pass undetected in the farm and garden, even though they may be present in high numbers. 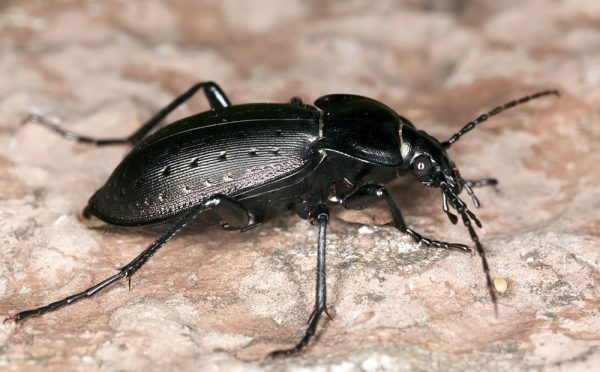 At first glance they may be mistaken for the large, black ‘darkling’ beetles (Family: Tenebrionidae) that are active during the day (particularly in desert areas), but differ in having` a much flatter abdomen. The larval stages develop in the soil (for up to 2 years, depending on species) and prey on other soil-dwelling organisms, including some pests.